Psychotic Breakdown or Spiritual Awakening? Jason Hartman interviews author and artist, Paul Levy, regarding his intense experience with what was deemed bi-polar mental illness, his spiritual awakening, and the journey to free himself from the psychiatric world. Wetiko is an indigenous term used by Native Americans to describe spiritual evil. Due to an intense personal trauma suffered a few years before, Paul had a life-changing spiritual awakening in 1981 that was misdiagnosed as a chemical imbalance and manic-depressive (bi-polar) illness. He was hospitalized numerous times and told he was having a severe psychotic breakdown and would have to live with his illness for the rest of his life. Paul explains how he became aware that, indeed, he was not suffering from a mental illness, but a spiritual awakening (Wetiko) and found spiritual teachers that helped him through his spiritual breakthrough. For more about his amazing story, listen at: www.HolisticSurvival.com. 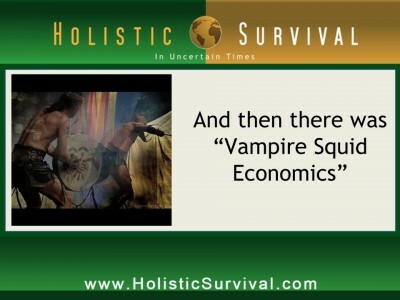 Paul talks about one of the chapters in his book, “Vampire Squid Economics,” which he describes as a perfect symbol of what happens when Wetiko gets into business. An artist, after the trauma of his shamanic break-down/through, he became a certified art teacher. Due to his intense interest in the work of C. G. Jung, by the end of the decade he found himself the manager of the C. G. Jung Foundation Book Service in New York, as well as the advertising manager for the Jungian journal Quadrant. In the fall of 1990, he moved to Portland, Oregon. In 1993, after many years of struggling to contain and integrate his non-ordinary experiences, Paul started to openly share his insights about the dream-like nature of reality. He began giving talks and facilitating groups based on how life is a shared waking dream that we are all co-creating and co-dreaming together. He is the founder of the ‘Awakening in the Dream’ Community in Portland, Oregon. He facilitates a number of ‘Awakening in the Dream Groups’ every week, which are groups of people who are awakening to the dreamlike nature of reality who are realizing that they can come together in a way that helps everyone deepen and stabilize their lucidity even further. A wounded healer in private practice, he assists others who are also awakening to the dream-like nature of reality. Paul is a pioneer in the field of spiritual emergence. A Tibetan Buddhist practitioner for over 30 years, he has intimately studied with some of the greatest spiritual masters of Tibet and Burma. He is the author of The Madness of George Bush: A Reflection of Our Collective Psychosis. Paul’s website is www.awakeninthedream.com. Narrator: Now’s your opportunity to get the financial freedom report. The financial freedom report provides financial self-defense in uncertain times. And it’s your source for innovative forward thinking, investment property strategies, and advice. Get your newsletter subscription today. You get a digital download and even more. The price? Only $197. Go to JasonHartman.com to get yours today. Jason Hartman: My pleasure to welcome Paul Levy to the show. He is the author of Wetiko: The Greatest Epidemic Sickness Known to Humanity. And this book has got the forward by Kathryn Austin Fitts who was on a prior episode, and I’m a big fan of her work. And it’s great to have Paul here coming to us today from Portland, Oregon. Paul, how are you? Paul Levy: Oh I am great. I am very excited to be here, so thank you very much for having me. Jason Hartman: Well the pleasure is all mine. Now you’ve got an amazing, amazing story here about what has happened to you and I think all of the listeners can really learn from it, can’t they? Paul Levy: Yeah I imagine that maybe some have had similar experiences and just in the real essence I had this life transforming spiritual awakening in 1981 that almost killed me. And it got me thrown in mental hospitals and told that I’d had a psychotic break from reality and I had a mental illness and I was going to have this mental illness for the rest of my life. And it was super clear from my point of view inside myself that I was having a spiritual awakening and I was really fortunate to be able to get through that and to quickly extricate myself from the psychiatric establishment. But we’re talking maybe four or five times over the course of that next year between ’81 and ’82 I was thrown in mental hospitals, medicated, diagnosed and my parents bought into it because in their world, people who are doctors are authority figures. And they very tragically bought into the diagnosis, and passed away convinced that their only child is mentally ill. And so there was a tragic aspect to it. But I just over the course of time, I was able to frame it as this is like sort of an initiation that I was going through. And it was actually showing something to me, and it’s actually been the very basis that’s informed my whole work. Jason Hartman: Paul, what is Wetiko? Tell people that. Paul Levy: The whole way I can answer that is that it’s an indigenous term, Wetiko, that the Native Americans would use for really describing the spirit of evil. And in my first book about President Bush being mad, and I coined a phrase, malignant egophrenia or M.E. disease. And then as I was writing the book I came across just a little bit of stuff on Wetiko. And over the course of time I found out more about it and I realized, oh my god, the native American people, they’ve been tracking exactly what I was calling malignant egophrenia. And for them it’s like the spirit of evil that can actually take over a person and the person then becomes in a way the instrument for this higher dimensional entity to act itself out. And so what I’ve done in my book, I’ve really translated the native American term into a modern idiom and really unfolded the concept with reference to shamanism and alchemy and quantum physics and western psychology in a way that really speaks I think to everybody, in a sense that it’s something that pervades the entire non-local field of consciousness and it’s something we all have in potential. Jason Hartman: so you say this is a disease of civilization? Paul Levy: Yeah, it’s definitely a disease of civilization in the sense that it has to do with being cut off from our true selves, cut off from our nature, our true nature, cut off from the environment. The thing about Wetiko, how it operates is through the blind spots in our unconscious and it’ll work through the projective tendencies of the mind in a way that we become actually entranced by our own projections. So a simple way of understanding it is that we’ll actually have a perception of what’s happening in the world and we’ll actually think that it’s objectively true, as compared to it’s just our perception. And then we’ll react to our perception as if it objectively exists, and condition ourselves and it becomes an infinitely self-perpetuating feedback loop that’s self-generating. And in the meanwhile, we catch or we get caught by this unconscious projective mechanism that’s part of just how we perceive our world and that becomes a doorway for the Wetiko. One could think of it as not only this spirit of evil, but it’s almost like you could say it’s like a germ or like a virus or like a parasite of the mind, like a tape worm. Because if you think about a tape worm, a tape worm gets into our system and then it’ll secrete chemicals so that we start to crave food that feeds it and we’re it’s host, so we actually feed it and it grows inside of us and it kills us. And that’s exactly the way Wetiko works. Jason Hartman: You mean the holographic field? Paul Levy: Yeah but the thing I particularly want to define is yeah it’s like the holographic field but it transcends third dimensional space and time. We think about in our third dimensional reality we think about for example, oh with light, it can’t go past the speed of light, just the way information can travel. But in a nonlocal world all of the sudden everything is connected with everything else. So there’s no boundaries as far as any third dimensional laws of space and time are just totally transcended. So the whole point is that the thing with Wetiko, it’s a higher dimensional entity that has transcended to our third dimension but operates in and through the third dimension. Jason Hartman: Okay. Fantastic. What else happened though? What was your awakening? I know this may have been really the question for the beginning, but what was the big deal about the awakening that someone would think you were mentally ill and how did they have to institutionalize you? Paul Levy: Sure. Well the thing was that, just to create a little context, I was deeply suffering. I was in incredible trauma because my father, it wound up that he was a very sick man. And he wasn’t diagnosed, but he was like this psychopath; a genuine world class psychopath. And I didn’t realize it at the time but he was completely taken over by what I’m calling malignant egophrenia, Wetiko. He was actually the embodiment of it. So he was in a way my teacher. So because I was the only child and I was the recipient of his abuse, it created this enormous suffering for me and I went into the suffering in a sense that I quickly figured out that I couldn’t figure my way out of the suffering with my mind. But the only thing that actually helped my suffering was to just step back and to just observe. Which is really, that’s like to start doing some form of contemplative meditative practice. So I started to do that more and more and more, and then at a certain point I got hit by this lightning bolt, but not in the sky, inside my brain just in a moment, while I was sitting in meditation this lightning bolt just ignited and I didn’t understand, I didn’t know that in a lot of spiritual traditions they’ll talk about having awakenings as getting started by getting hit my lightening. They’re talking in a mythical way but also in a real way. And so within 24 hours I went into such an altered state where I just snapped out of my typical conditioned, repressed identity pattern and I was acting so unbelievably spontaneous and I was in this ecstatic state. So of course from people who, they saw me and they thought oh my god he’s having some sort of break down. So they brought me into a hospital where they…but the thing I should say was that the subjective experience I was having was I was beginning to realize oh my god, this is a dream, that we’re having a mass share dream. And that that was the nature of our experience. And of course I hadn’t developed the fluency I have now, after 30 some odd years, many decades, but that was a very clear experience of oh my god, we’re actually having this dream. And I saw, wow we can actually in a way configure ourselves and get in sync with each other such that we can all help each other to awaken to the dream-like nature. And to actually change the dream, change the waking dream that we’ve having. And I was actually seeing that very clearly. But in my enthusiasm, like I said, I hadn’t developed the fluency or I was just so completely excited about it. And that’s typical because typically one needs time to integrate what one is seeing. For me, I just got propelled over this edge. So like I said, between ’81 and ’82, four or five, six times, I don’t remember exactly, I had this propensity because I was out in the world, I was out of a container. I wasn’t in a monastery or an ashram. I was just out in the world, so I kept on having this propensity to get myself thrown in hospitals. Jason Hartman: Wow. That’s something else. So who actually put you in a hospital? Paul Levy: Well the first time it was a really good friend who was visiting me. I was living out on the west coast and he was visiting me from the east coast. And the thing I just described when I began acting so incredibly unlike my typical ordinary self, he was scared and he wanted to take care of me. The thing was that to all appearances it appeared that I was having a break down, and I should point out too, I didn’t know it at the time but one of the ways I was describing my experience was that I was having a shamanic sort of initiation. And like any archetype of the shaman, first of all that archetype gets conciliated from having some sort of emotional upset, if there’s some sort of problem or something that’s going on, that actually activates the archetype of the shaman. Because then we start to go in search of the part of yourself that split off. And when a shaman actually gets called, it’s not something that one consciously chooses to do but when the deeper process or the deeper spirits call one to be a shaman, then it almost always will appear like you’re having a break down, like you’re having a psychotic break. Because you’re inner constitution is in a way being deconstructed so that it can get rewritten in a much more coherent fashion. So all of that was happening for me and then the second, third, fourth, sixth time that I got hospitalized, it was just either friends or my parents; keep in mind it was happening for me in ’81 and ’82 and that was like the stone age. Even now people have a little bit of an understanding that sometimes when people have these abnormal experiences, it might be some higher form of spiritual awakening or an emergence, where back then any sort of aberrant abnormal behavior, psychiatrists are just trained to pathologize. So they immediately pathologize me. And then the fact that I wasn’t just signing on and agreeing to their diagnosis just confirmed to them how mentally ill I was in this feedback loop. It was really a nightmare, and I see now it was really a decent for me into the underworld, and very thankfully I didn’t get caught there but many people do. And many people spend their whole lives, who are potentially awakening and healing, and they take on a diagnosis, they get caught in the whole psychiatric system, taking drugs, and it’s incredibly hard to get off the drugs, and it’s tragic. So I went through that and was really fortunate to be able to extricate myself but it was not easy. Jason Hartman: Wow. What an amazing story. 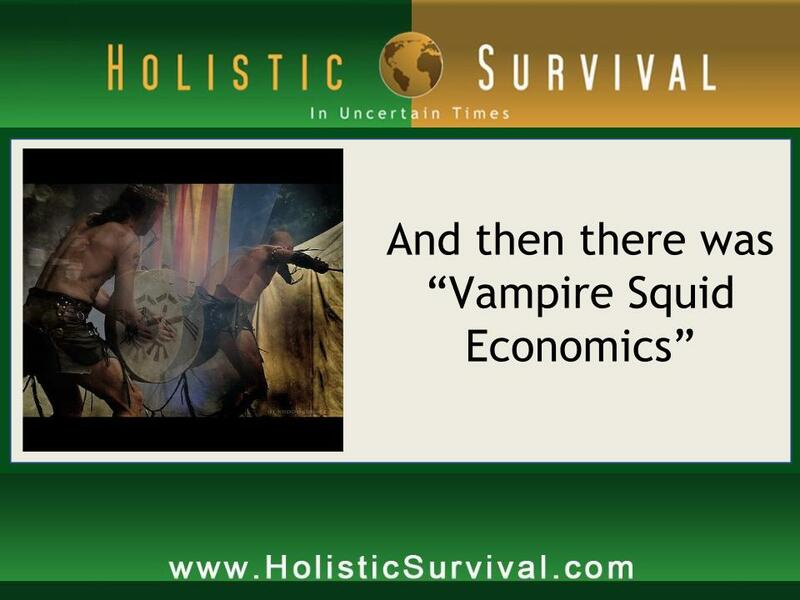 In the book you talk about, and this is a very creative title, Vampire Squid Economics. What is that? Paul Levy: What I basically did is in the book I unfold about Wetiko, because it’s an incredibly…When you find the name for something, just like in mythology when you find the name of a demon it takes away the power of the demon. So that’s why I really try to bring out the name Wetiko and I point it out in the book that one way of studying Wetiko is to see how it infects a system that’s made by the human mind, or how it infects the human mind itself. And when you study the financial system in the world, in our country, in the world, the whole economic system, you understand that it’s actually a model for how Wetiko operates. One example, you mentioned Catherine; Catherine Austin Fitts, who’s a good friend of mine and who wrote the forward to the book. She’ll talk about how we invest our money is how we vote in a sense and how we spend our money. And if we’re investing our money in the corporatocracy…again, she talks about, it’s like a tapeworm, tapeworm economics. That when we invest in the corporatocracy, we’re actually feeding the tape worm and we’re actually supporting our own, in a sense, murder. Jason Hartman: I would say the same thing. I would say the same is true with government, wouldn’t you? It’s like we’re feeding a monster. That’s the problem. Paul Levy: Totally. So why I have that chapter on Vampire Squid Economics is because it’s a perfect symbol of the way Wetiko works when it gets in business. And the point is that one can study any system and see, and as I was talking to you about before, what I do for a living, one of the things, I have all of these people and we meet in my home three or four nights a week. We just inquire into present moment by being together, maybe imagine a dozen people every night and so the thing is though that the way Wetiko actually operates is through relationships and like I was saying before, through the unconscious and through the parts of ourselves; we all have a blind spot. So, the thing about Wetiko, it’s a form of psychic blindness but it’s a form of psychic blindness that not only it has the belief that it’s the one who’s sighted and it believes that it’s more sighted than anyone else in an arrogant way. But really, it’s actually blind. It doesn’t even see what it’s doing. So the unfortunate thing is that people who are infected with Wetiko get in positions of power, they can actually be in a position to really influence stuff that happens in the world in a way that’s very, very destructive. The thing about Wetiko to understand is that it’s a disease of the soul that we all have in potential. And at any moment we can all fall prey to it. And yet, what I’m pointing out in the book, is that encoded or hidden in Wetiko, it’s actually like this incredible blessing that’s actually helping us to potentially wake up really. It’s actually teaching us about the dreamlike nature of reality. And that’s in a sense what’s so incredible about this [0:18:03.8] disease of the soul that the natives call Wetiko, is that it’s either going to destroy our species, and the evidence is all around us that that’s what’s actually in fact happening, or if enough of us have the recognition of what it’s revealing to us, we can actually see the dreamlike nature, begin to wake up and then connect with each other. Because it’s showing us, for example when I say the dream like nature, what I mean is that when you’re in a dream, in a night dream, and you don’t know you’re dreaming, you think you’re awake, and then if you have simply the recognition of the nature of your situation, i.e. that you’re dreaming, then you discover oh wow what all of this is, is it’s my own energy, it’s my own reflection. And all the other characters in the dream, they’re not separate from me, they’re just embodied reflective aspects of me. So it cuts through the separation of us versus them. And that’s what Wetiko can potentially show us. So in the meanwhile it’s destroying us but if we understand what it’s showing us, it can help us to see the interconnectedness and the interdependence that we all have with each other. Jason Hartman: Paul, at the beginning of the show you mentioned, just kind of quickly, you mentioned George Bush. What was the connection there? Jason Hartman: Now, which George Bush, first of all? The 2000-2008 George Bush? W? Paul Levy: The 2000 to 2008, right. So the thing I was pointing out with Bush, was that like so many of us saw that we was really taken over by something. And the thing with Wetiko is it’s an archetypal energy that actually takes people over and they become in a sense the incarnation of the disease. So I was having the realization, oh my god here’s Bush who is actually in a sense the full blown embodiment of Wetiko. Jason Hartman: What do you think he was taken over by? What do you mean by that? Why was that so obvious? I’m just curious. Paul Levy: If you see what was driving him was this addiction to power and then power over others. So he wasn’t really in touch with being related to other people or to the environment. He didn’t realize we were all interconnected and interdependent but it was just really clear that he just wanted, as far as control and power, that he just wanted to gather as much of it…think about anything he did during those 8 years that he was in office. It was all about to centralize control and power. Jason Hartman: Well just for comparison purposes, I’m no huge fan of George Bush by any means, just so you understand where I’m coming from, but do you think Obama’s any less or is he taken over by Wetiko also? Paul Levy: I would say totally he’s taken over by Wetiko but in a totally different way because it’s almost like an advertising campaign where he’s presented as way more seemingly, well first off he’s so obviously at least on the surface more intelligent, more articulate, and more concerned about the ordinary person. But I’ll talk to Kathryn about this and we’ll study his policies and his policies are totally even more so, when compared to Bush, are basically having to do with centralizing control and power in the hands of the few. Jason Hartman: Oh my god, Obama, he is the king of that. I’ve done other shows where the guests have talked about him. He has taken over and basically “nationalized” more of our economy than any other president in history. It’s unbelievable. Paul Levy: Yeah. So the thing is anybody who’s in a position to become president, they’re clearly in the pockets of the powers that be. They’re just the instruments of that. So the people who are entranced by Obama, oh he’s so great, he’s so goodhearted and all this stuff, and Michele, she’s so wonderful and I would just say yeah they’re totally under a spell. And that’s the thing about Wetiko, is that it’s of the nature of a spell. The thing about Wetiko, it’s a collective psychosis and we are in the middle of a collective psychosis called Wetiko. That’s actually what’s happening. And it’s so pervasive that we’re not even talking about as a species that we’ve gone mad. Because it’s become just this normal thing. Like when you have a fish in water, it doesn’t notice the water. So it’s very much like that, and so just to know with Obama, I’m very disheartened and I see that he’s just another display or a manifestation of the way that the Wetiko bug can manifest. Jason Hartman: It’s interesting because with Bush, everybody pretty much knew he was in the pocket of the corporations, right? But with Obama they don’t, but he still is. He is such a fascist. He’s so in bed with the corporations, it’s unbelievable. Like Michele puts a garden in the white house and talks about health and organic food, yet he appoints the former CEO of Monsanto as his secretary of agriculture. It’s just insane. Paul Levy: Yeah, if you take a look at who he’s appointing for his economic advisors, they’re the same people who actually created the economic problem in the first place. Jason Hartman: Obama is just George Bush number 2. It’s like the same old thing. How many times do we ever really get a choice like Ron Paul? It’s just ridiculous. It’s too bad. It really is. But crazy, crazy stuff. Paul Levy: Well crazy being that it’s a collective psychosis. And it doesn’t make a difference what the name you call it is, whether malignant egophrenia, Wetiko, somebody could come up with their own name. but the point is when you find the name and you find the actual proper name of the demon…see the thing about Wetiko, because it operates through the unconscious, it will compel the person who it’s taken over at any given moment to become it’s instrument and it will compel them to act it out on the world stage. So the thing about Wetiko, see it’s so trippy because it’s an inner disease of the soul that’s explicating itself through the medium of the outside world so you actually can see it. It’s actually revealing itself to us every moment of the day through what’s happening in the world, but we don’t have the recognition, but it’s synchronistically, it’s actually reflecting through how it operates in the outside world an actual state that’s happening inside of us. So the thing is, if we think that evil is outside of us and react against the evil trying to destroy the evil, then guess what? We’ve fallen under the spell of Wetiko. But if we see the evil outside of us and we have the recognition, oh, this is some sort of a dream so what I’m seeing out there is similar to a dream, is a reflection of the same evil that’s inside of me. And then you’re able to actually see that evil because we all have a shadow inside of us and are able to metabolize that. And then we actually are cultivating our wholeness and then we’re in a position to actually maybe even be of help for the evil that we see in the world. Jason Hartman: Very interesting. Well tell people where they can get the book and also give out your website and where they can learn more. Paul Levy: Sure. Okay so, you can get the book on my website, www.AwakenintheDream.com and it’s right on the main page, is the book and you can order it and I send it out personally. And that’s the website. Awakeninthedream.com. Jason Hartman: Fantastic. Well Paul Levy, thank you so much for joining us today. Paul Levy: Oh it’s totally, I am just feeling really honored that you would have me on to talk about this stuff because it’s super important stuff to shed light on. So thank you.